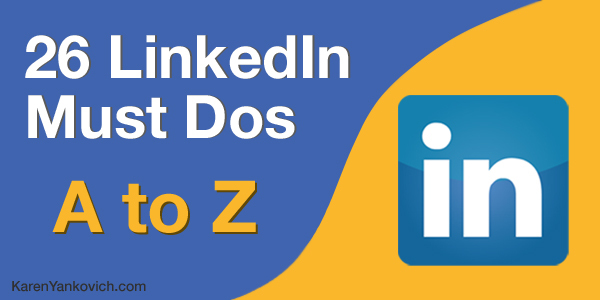 26 LinkedIn Must Dos from A to Z! Always be of service. Give endorsements, give recommendations, help others by answering questions in groups. Be comfortable with advanced search. Spend 5 minutes and take a look around. Click on Advanced Search next to the search bar. Find 2 (or more) people in your local area who are in your business niche. See if you can connect over coffee! Create a compelling headline. Headlines are the most searchable item in your profile. USE THEM! Use it all, every space, every character. TALK to your prospect (client or boss) in a way that makes them compelled to respond. Be creative! Dedicate time each week. Add LinkedIn to your schedule, a few minutes a day, or a bigger chunk on the same day every week. Dive into the groups one day and the search features the next. Experience does not mean only paid employment! Your blog posts, your volunteerism, your interests all serve to round you out as who you ARE, and what you KNOW. Focus on being the expert in your niche. Did you read a great article today that would help others in your field? Post it! Share it in groups as well. Start a discussion you can lead. Did you write a juicy blog post filled with tips? Add it to your profile under your experience section OR as a publication OR link it to your summary section. Generate great content. Enough said. Headlines are necessary. They tell people who you are who you help how you help them. Use the words they will be looking for and thinking about Before they find YOU. Try out a few different headlines and then search for yourself with some keywords – how do you rank? Which one ranks you higher? Invite your email list. Start with who you know. Then branch out from there. Join groups. Use the search feature set to Groups and plug in some key words: key words for your niche, keywords for your future perfect job posting, keywords your prospect clients use. Scroll through and find groups of various sizes. Join large active groups for great research AND smaller less active groups where you can stand out as the expert. Keep your headshot current. No one needs to know what you looked like in 1990. Yes we know you were younger then, but it’s OK! We all want to see the real you. Maybe it’s time to invest in a professional photo to uplevel your brand of you? Leverage your network. Start by messaging those who are already in your network. Who do they know? What do they need? Why are they in business? The people who are already a part of your foundation are a fount of ready information (and usually much more willing to share). Manage your expectations. It will take time to grow, but soon enough you will start seeing the numbers and connections take off. Never give up. It can feel like a lot of work, but it is my #1 go-to place to find prospects in business, new leads, future partners, and more. Offer to help connect people. Be generous, think of potential partnerships for your network connections and set them up. You never know what can come of a beautiful business friendship. They may do the same for you someday. Profile pictures are mandatory! You must look your best AND fit your business niche. The safest is a professional looking headshot no matter what business you are in. Quit all the promotions. Share the juicy parts of your business with your groups and connections! They will remember and come back for more. Regular posting of updates. Remember consistency is still KEY here on LinkedIn too. Make sure it is part of your regular social media posting routine. Snag your public profile URL. Click Edit Profile. See the little LI symbol with your url next to it? Click EDIT to the right and change it to be just your name. Is your name taken? Add your middle initial, middle name. Keep it simple and clear. Take your time. Be thoughtful, in your profile, in your connecting notes always be true to you and who you are in business. Use all 2000 characters for your summary. Your summary is the #1 place people will read, and the #1 area that is searchable for LinkedIn (and Google) algorithms. Just like your main headline, use every character, every space, add specialties Fill that baby up! Vouch for others. Give recommendations and endorsements! Be generous and it will be returned. X-ray vision. Use LinkedIn like x-ray vision. Find the hidden gems that speak to peoples personalities, business interests and NEEDS that you can fill. Yada yada yada. Follow this blog, join my LinkedIn Group, and listen to the other talking heads chat about tips for using LinkedIn effectively. Zoom in on your hidden audience. Use LinkedIn’s vast and amazing search functions to find out where your prospects are hiding out and connect!